The crochet tablecloth: Delicate but enduring. Whether petite or grand, a circular table can be beautifully enhanced by a crochet round tablecloth. Patterns are available online and in project books, including rare, vintage editions. Crochet is a handicraft that creates fabric out of yarn or crochet thread and a hooked needle. With just these two supplies, you can create delicate, intricate compositions of loops and chains. Crochet is often used to make scarves, hats, baskets, afghan throws, and tablecloths. Unlike other handicrafts like knitting or weaving, crochet's history is a bit mysterious. No date or country of origin can be named with certainty, though there are theories that hail crochet from Arabia, South America, and China. Which is correct? No one can say for sure. Its name however is traceable. It's based on the Middle French word for hook, "croc(he)" which itself is a diminutive of the Old Norse word "krókr" (hook). What is also known, is that crochet took off in Europe in the 1800s, with Queen Victoria even learning the craft herself. In the Edwardian era (1901-1920), crocheting emerged in its modern form, with more complicated stitching and a preference for ivory and such pale hues. The fabric was a symbol of elegance. As with the craft as a whole, the first time a crochet tablecloth was made is unknown. However, what is known, is that the crocheted tablecloth was made for decorative reasons; not practical purpose. 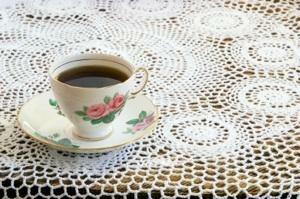 Indeed, the crocheted tablecloth evokes a time gone by when high tea was a common occurrence. Today, a crocheted tablecloth doesn't seem old-fashioned, but simply a beautiful accent. Crochet can either be done in rows or in a round. For crochet round tablecloth patterns, the objective is to create a perfectly round fabric. Since crocheting is done one full "round" at a time, this is quite simple to achieve, so long as the stitches are kept in order and the same size. To give crocheted fabric its uniform look, everything must be repeated precisely. For the first, a chain of specified chain stitches (ch) is crocheted. Then to make the ring, the hook is inserted into the first chain stitch made, through which the yarn/thread is pulled, linking the last chain with the first, forming a ring. From this foundation, the loops begin to build out the round. For the second, a "magic ring" starts things off. See this tutorial for step-by-step instructions, plus photos to guide you along. Whichever method you choose is personal preference; however, crocheters tend to use either one or the other, not both. For a round pattern, it all begins with creating a small ring to build from. Once you've refined your crocheting skills, you might want to try a more ambitious project, like a cardigan or maybe a crochet round tablecloth. Patterns are very detailed, so you shouldn't feel lost at any point. If you stay organized, you should be able to start, stop, and start up again. Be sure to mark your place, both in the pattern and your crocheting. For crochet tablecloth patterns, start with these sites. Some patterns are free, while others are available for a small price. Crochet Pattern Central: A collection of 20 crochet tablecloths, including a colorful floral square. MomsLoveofCrochet.com: Detailed patterns, including a round pineapple tablecloth. Hass Design: Purchase filet-crochet tablecloth patterns, including a dresden round. Includes round and oval designs. Guide Pattern: This website offers 18 tablecloth patterns, including several round ones. Free Vintage Crochet: You'll find several round patterns amongst this site's plentiful offerings . Etsy: You'll find several heirloom round tablecloth patterns at this website. Craftown.com: A free round-by-round pattern resulting in a pineapple motif.